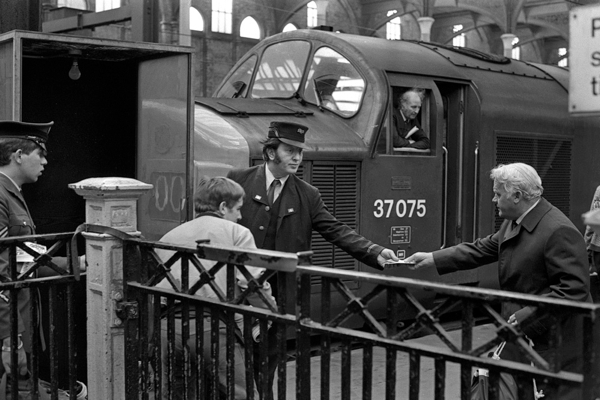 “I have always liked railway stations, a focal point of the community – the start and finish of a journey,” Photographer Tony Bock admitted to me, introducing these elegant pictures which are published here for the first time today. 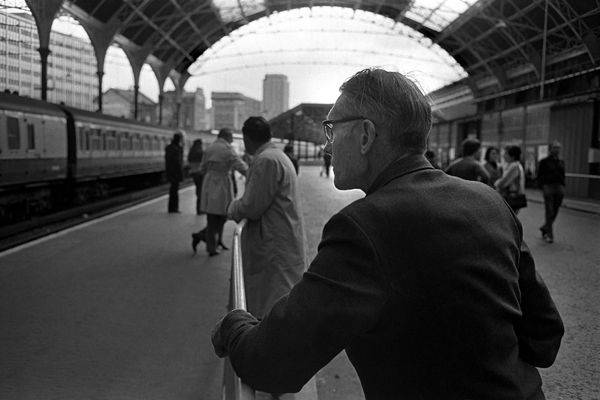 “Often the journey was a daily chore, but sometimes it was an occasion,” he added, in appreciation of the innate drama of rail travel. 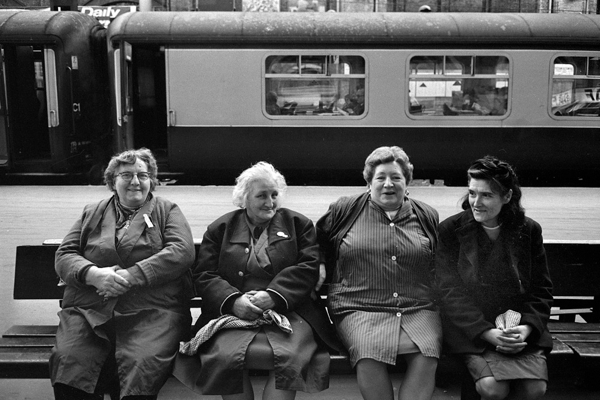 Tony’s railway photographs date from the years between 1973 and 1978, when he was living in the East End and worked on the East London Advertiser, before he left to take took a job on the Toronto Star, pursuing a career as a photojournalist there through four decades. “Although plenty has been written about the architecture of railways and the industrial ‘cathedrals’ – from the perspective of the twenty-first century, it is easy to forget the great change the railway brought when it first arrived in the mid-nineteeth century. 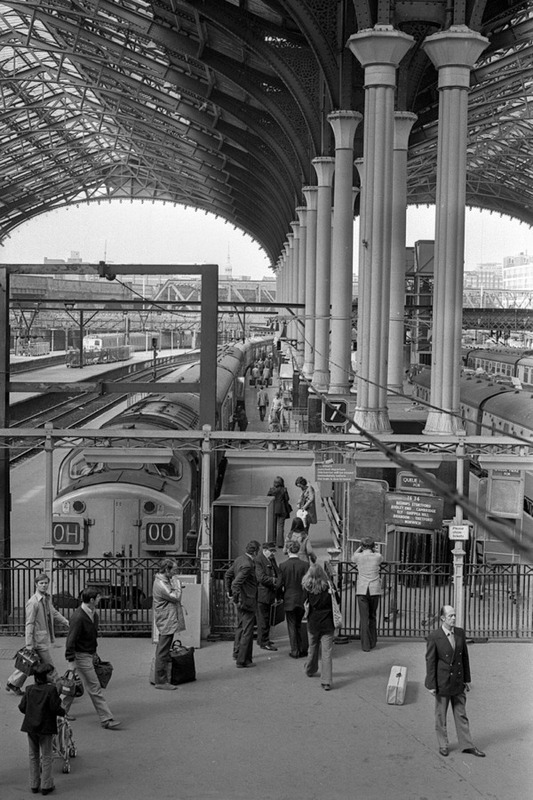 Liverpool St Station was opened in 1874 and survived largely unchanged into the nineteen seventies. 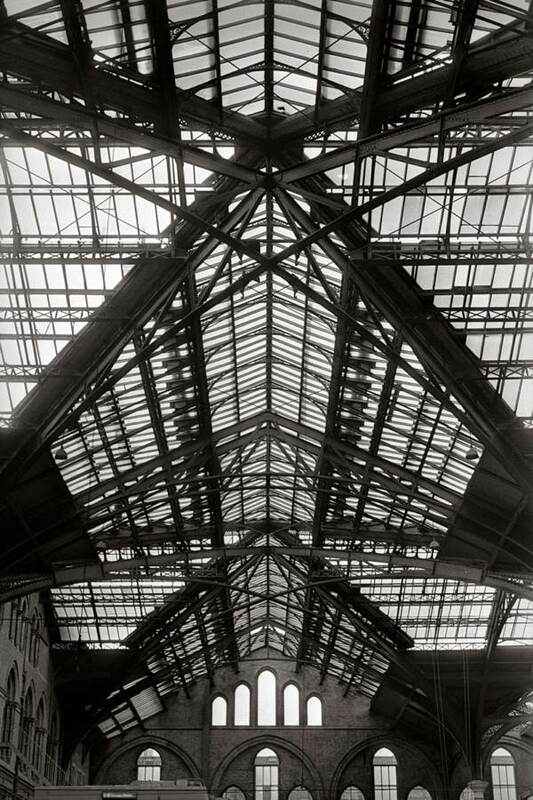 So, in 1977, when proposals to redevelop the station were suggested, I decided to spend some time there, documenting the life of the station with its astonishing brick and iron architecture. I loved the cleaners, taking a break, and the young lad taking it upon himself to reschedule the next train – ‘Not This Train’! Meanwhile, the evening commuters heading home looked as if they were being drawn by a mysterious force. 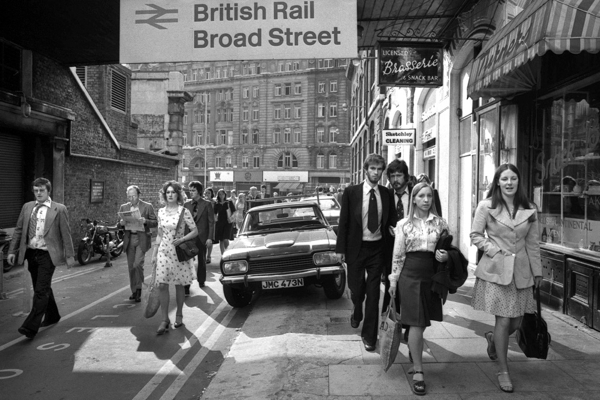 Next door to Liverpool St was Broad St Station, only used for commuter trains from North London then and already it was looking very neglected. Only a few years later, it closed when Liverpool St was redeveloped. 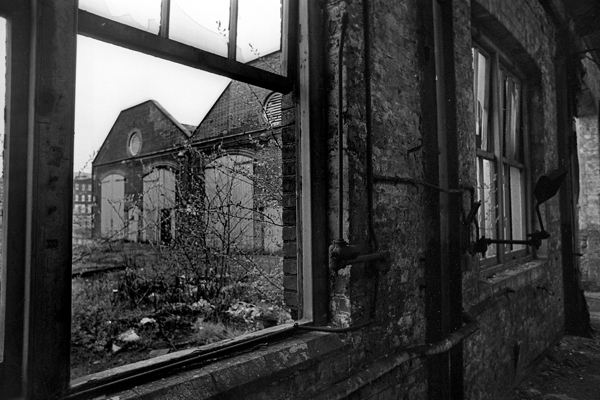 Over in Stratford, the rail sheds dated back to the days when the Great Eastern Railway serviced locomotives there. 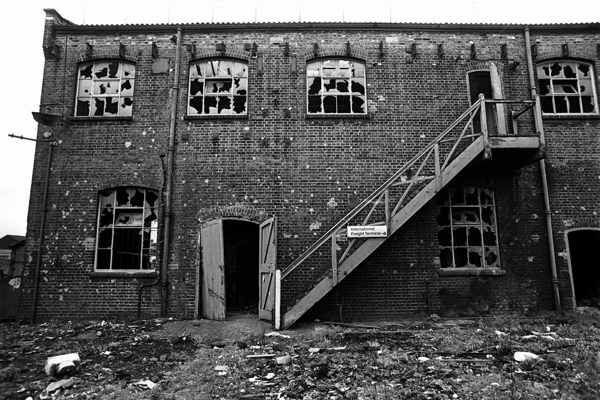 Surprisingly, British Rail were still using some of the sheds in 1977, maintaining locomotives amongst the rubble that eventually became the site of the Olympic Park. 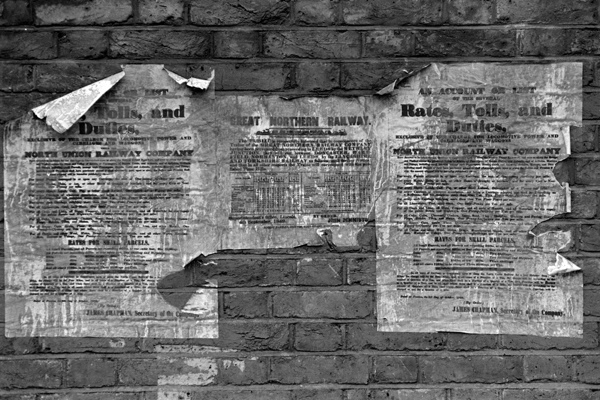 Finally, from the very earliest days of railways, I found three posters on the wall in the London Dock, Wapping. The one in the centre is from the Great Northern Railway, dated 1849, the other two from the North Union Railway Company, dated 1836, and it is still possible to read that one hundred and twelve pounds or ten cubic feet would be carried for three shillings according to the Rates, Tolls and Duties. The North Union operated in Lancashire and only lasted until 1846. How did these posters survive, they were likely one hundred and thirty years old. I wonder if anyone was able to salvage them? Cleaners, taking a break, at Liverpool St.
Commuters at Broad St Station. 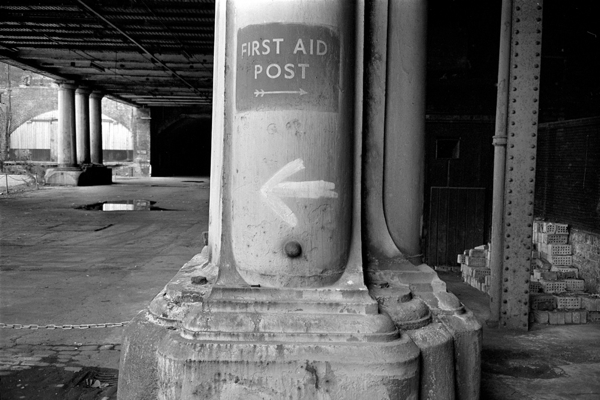 Wartime sign in the cellar of Broad St Station, demolished in 1986. One of the great things about Broad Street was the list of destinations etched into the stone of its entry Including St Petersburg! It made me smile every day when I used to commute from there. After reading these everyday and loving them for months now…it was only with this one that I must have been more focused on the text rather than the pictures; only to discover Tony Bock is here in Toronto. I love the East End of London and his recording of it, at that time is so interesting as I think it was a time great change in the UK and it is fascinating to see it from this era. I love his photographs. Thank you both Gentle Author and Tony. It’s a treat to see pictures like these, especially when you know what it’s all like now – much more enclosed, claustrophobic. And the change in attitude – notice the suitcase left unattended? Loved the rather bored Railway attendant as the crowds said goodbyes to their loved ones! 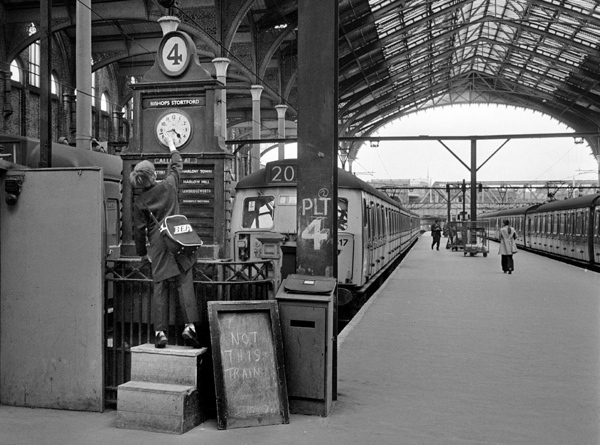 As a child, my nearest station was Victoria. I have fond memories of the News Cinema, intended to while the time away for travellers waiting for connections. It had A and B movies of course, and newsreels which held rather less attraction for a small child. Actually, as far as I was concerned, the B movies weren’t up to much either: travelogues of Patagonia, that sort of thing. 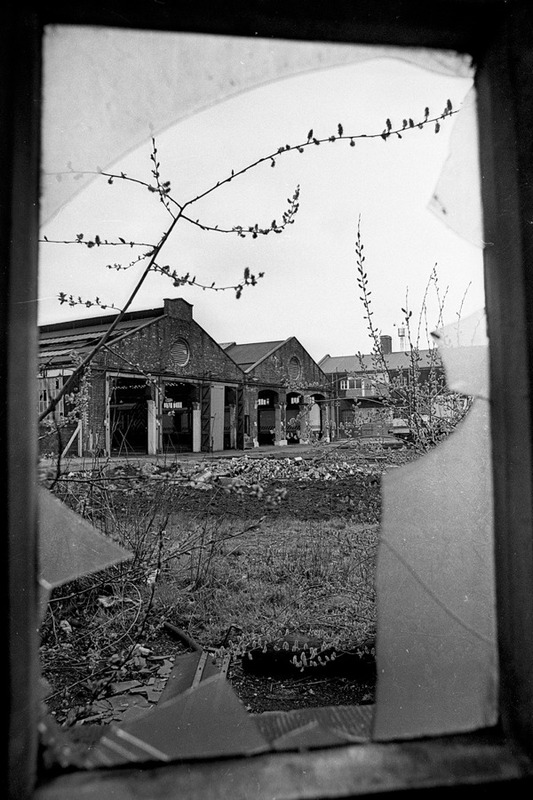 David Brief: I think that was Blackfriars – see http://mural.uv.es/jahesa/granta_extract.htm. Or did Broad Street have similar carvings? Thank you for publishing these for the first time. I do hope Tony will share these remarkable photographs with the London Metropolitan Archives in due course, for future generations. Such great photos.I was born in the East End Of London in the 50s and grew up with these images.A trip back through Memory Lane. Tony, your images and story are very wonderful, thank you! 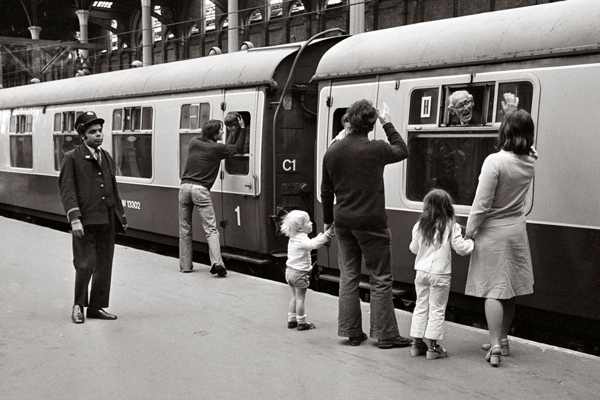 I’ve always loved train life; travel, stations, the comings and goings indeed anywhere/anytime all these years. Lovely! Cheerio. wow I started work at 16 in 1976 at stratford deport .. As a drivers assistant . Worked with all older guys from the old days of steam locos and ww2 , the deport and Liverpool street station was full of history . I heard it all first hand , these few photos took me back to them days . 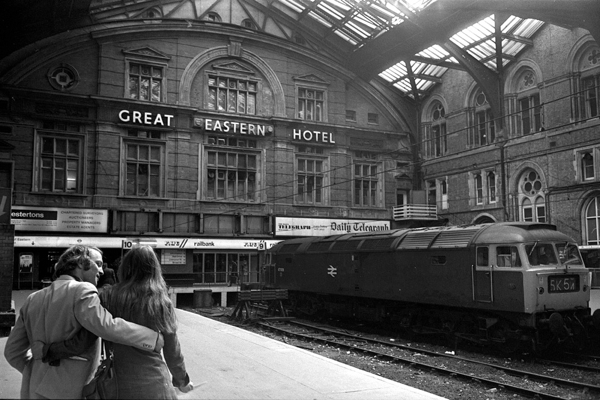 I was one of the crew that sat on that class 47 loco at the stops by the great Easton hotel . I was taken back just for a moment to a conversation I was haveing with a old driver called Charlie finchham sitting at those stop under the banner for the hotel . They were great stories from great guys that really saw a lot , all gone now . Wish there was video then but I’m thank full for the few pics . Great photos I was at Stratford from 1972 to 1987 and transferred to Penzance the photos brought back many happy memories.